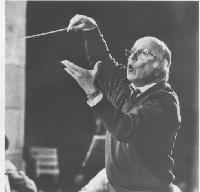 Paul Kuentz (Born May 4, 1930 in Mulhouse) is a French conductor. He founded the Paul Kuentz Chamber Orchestra in 1951 and in 1972 the Paul Kuentz Chorus and has toured internationally. He is married to Monique Frasca-Colombier.